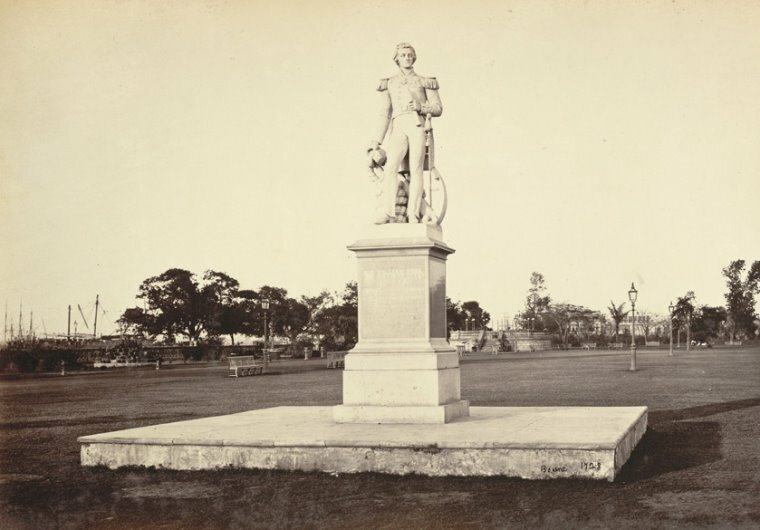 The statue of Peel in India now stands at Flagstaff House in Barrackpore. This building was once used by the Viceroy's Private Secretary. it was moved from Eden Gardens in Calcutta to Barrackpore when 'the Left Front took over in 1977'. Fifteen miles up the Hooghly River from Calcutta lies Barrackpore, summer residence of the Viceroys in the days before the capital was transferred from Calcutta to Delhi. The surviving buildings include Government House itself, a classical mansion of 1813, and a number of smaller buildings and monuments including the grave of Lady Canning, all set in what were once well-manicured riverside gardens. A prominent surviving feature of the grounds is one of the largest Banyan trees in India, under which outdoor receptions used to be held. These jottings from the Governor's diaries pertaining to the statues of British personages now housed in Flagstaff House, Barrackpore, with some notes by him on the subjects of those statues. These were written by him on February 1, 2007. More importantly the Governor found that the statue of Peel in Flagstaff House was not that of Prime Minister Peel but of his son, William Peel. This revised issue corrects that entry. To the Cenotaph's side, facing the garden and its glorious tamarind tree, is the only marble piece in the Flagstaff House collection of statues. It is also the handsomest. It is of Captain Sir William Peel VC KCB who lived for a mere 34 years from 1824 to 1858. 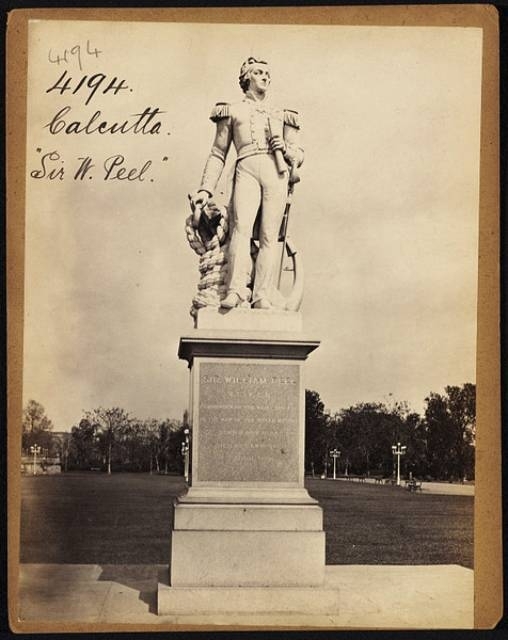 When I first saw the statue and saw the simple name 'Peel' written on it, I at once concluded, erroneously, that this statue was that of Sir Robert Peel, the Conservative Prime Minister of Britain over two terms, December1834 to 1835 and then again, August1841 to June 1846. I went on to examine the statue thinking it was that of the Prime Minister and recalled the coincidence of Prime Minister Robert Peel being born in the same year that saw the impeachment of Warren Hastings at London's Westminster Hall in which Burke had called Hastings "the captain general of iniquity - thief - tyrant -robber - cheat - sharper - swindler" and added "The English language does not afford terms adequate to the enormity of his offences". Peel's first – and brief – Prime Minister ship had coincided with the Governor General ship in India of William Bentinck and Macaulay's membership of the Governor General's Executive Council. Bentinck was altogether different from his predecessors, in that he regarded 'holding India' as something that had to do with people rather than territories. Did Peel share Bentinck's view? Did he know or know of the great Rajah Rammohun Roy outside of official dispatches? The Rajah was in England during Peel's high noon. Did they meet? I wished I knew. Prime Minister Peel's frequent resort to the repealing of laws led to the Birmingham Argos coin a couplet -Oh Member for Oxford, you shuffle and wheel You have changed your name from R. Peel to Repeal. Crime was taking a heavy toll in London and Robert Peel established the Metropolitan Police Force, whence the popular names for London cops - 'Bobbies' or 'Peelers', the first of which survives to this day. But all this recalling of the 19thcentury Prime Minister was, really, misplaced. What I was looking at was the statue of Peel's third son, also educated at Harrow like his father. William Peel, as I discovered later from the internet, was a captain in the Royal Navy, who served famously with the Naval Brigade during the Crimean War. After the Crimean War, William Peel served in the Indian Mutiny, and was wounded at the Relief of Lucknow. He was made a Knight Commander of the Order of the Bath, and thus became Sir William Peel. Short and hectic as his life was, William Peel wrote an account of his travels called A Ride Through The Nubian Desert, in 1852. Our library must acquire a copy. He survived the Relief of Lucknow but, irony of ironies, died of small pox in Cawnpore (Kanpur) on 21 April, 1858. In the Hindi of daily converse, the pox is called mata and, in Tamil, ammai. Why should this 'mother' of illness and of mortality have chosen so handsome and brave a youth? If he had to die so young why could it not have been on a battlefield? But, to return to the statue, full head of hair waved back, almost inviting a woman's head to tousle it, shows the lower ends of both ears. William Peel is stunning in both profiles. Standing with his right foot forward, heeled but unbuckled, there is a stance to him as different from a posture. His braided trousers in four stripes cover the ankles fully. Whoever his shoemaker was, he was a perfectionist. I would advise any beholder of the marble statue of Peel in Flagstaff House to not miss those shoes. Scabbard suspended to the left at the waist, broken at midpoint, or incomplete, on two buckled straps seems to suggest something. Strong but not violent? The statue's rear shows a strength of shoulder blades that their covering cannot conceal. The waistband is tight without being constricting, making the attire waist down billow without bulging. The left hand is bent upwards like a left inclined capital L, holding a telescope, while the right hand rests on the ring of a broken anchor from which is suspended a plaited rope coiled in a seven-tiered heap. Rapunzel would envy that plaited pile. The curved blade of the anchor joins the left hem of the Captain's coattails- a sculptural ingenuity of real class. Two rows of six buttons and any number of medallions on the left breast and shoulder tassels in artful disarray make the Captain's torso a handsome subject for the sculptor, W. Theed. The front of the trouser frame waist down shows a perfect form, the creases where they form suggesting more than saying. I found the young Peel's fingers around the rim of the anchor done so sensitively that I could 'feel' his index finger on the sharp edge. Peel was always on the edge of death. Peel's is the only non-equestrian statue on this side of the garden (barring King George's). The statue's original location in Calcutta (Kolkata) is under verification. The statue at Flagstaff House in Barrackpore, India.